Most people struggle to remove hard water stains on bathroom and kitchen surfaces. It is often believed that you need strong, harsh chemical cleaners to get rid of them effectively. There is, however, a better, simpler and more affordable way to remove these stains. Watch this easy to follow tutorial that shows us how to clean a kitchen sink, and read on to learn how it's done. This may be the fastest, easiest, and most natural way to clean hard water stains, that also works for porcelain surfaces! It requires minimal effort, so give it a try the next time you clean your house. Place a bowl in your sink and pour some distilled white vinegar in it. Take an old rag and fully soak it in the vinegar. Make sure the sink is completely dry. Drape the soaked rag on the stained surfaces and press it firmly against the sink and into any seams or cracks. Let it sit for 1 hour, then place it back into the vinegar. Take an old sponge and gently scrub the sink to further remove the hard water stains. Notice the whiteness coming off and the sink getting shinier. Place your rag on any remaining stains, paying attention to areas that are more built up, and leave it on for 1 hour. 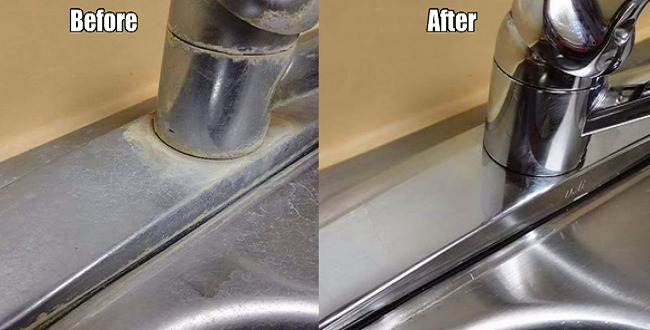 Repeat the gentle scrubbing and you should have a clean, shiny and renewed sink in no time!